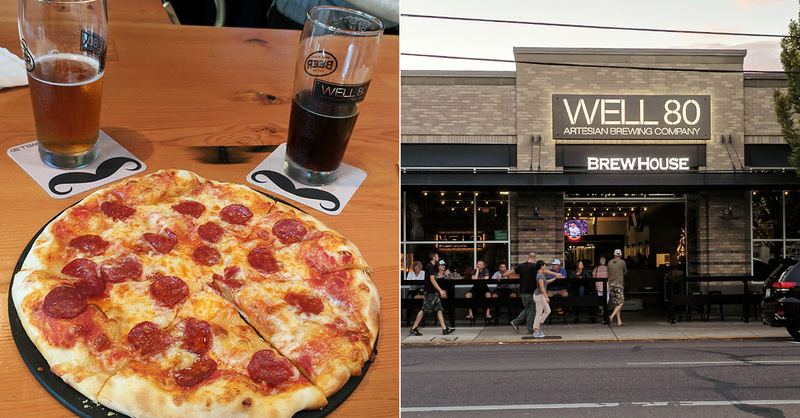 Best restaurants in Olympia, WA (breweries included) • Where Is Your Toothbrush? It’s easy to forget Olympia, Washington, a small town of 51,000 people in the South Puget Sound, is actually the capital city of our nation’s 42nd state. Blink and you might whizz right past Olympia on your way to and from Seattle. Blink and you’ll miss the impressive Capitol building and campus perched on the hill above the city. Blink and you’ll miss Olympia, Washington’s best kept secret: its quietly buzzing food and beer scenes. So what are the best restaurants in Olympia, WA? We did the research so you can just sit back, relax—and chow down. Is a great breakfast or brunch spot the mark of a sophisticated food scene? Mimosa and waffle lovers would say yes. Don’t fear, Olympia’s popular breakfast and brunch spots are just like everywhere else: long waits after 10:00 a.m. So you won’t miss out on your Sunday morning sidewalk loitering ritual, we promise. Hash is one of the most popular breakfast places in Olympia, WA. It could have something to do with the complimentary corn bread and berry butter, the namesake Point Cut Corned Beef Hash and Eggs, the laid back atmosphere that is signature Olympia, or all of the above. Hash’s menu is unique and deviates from typical breakfast fare. When was the last time you had a Blueberry Pistachio Waffle? If sweet breakfast isn’t your thing, try the Dungeness Crab Omelette or Biscuits and Bacon Gravy. You won’t find adult beverages on the menu at Hash, but we think you could use a break. JK! LOL! There are people who judge brunch by the quality of the Huevos Rancheros. 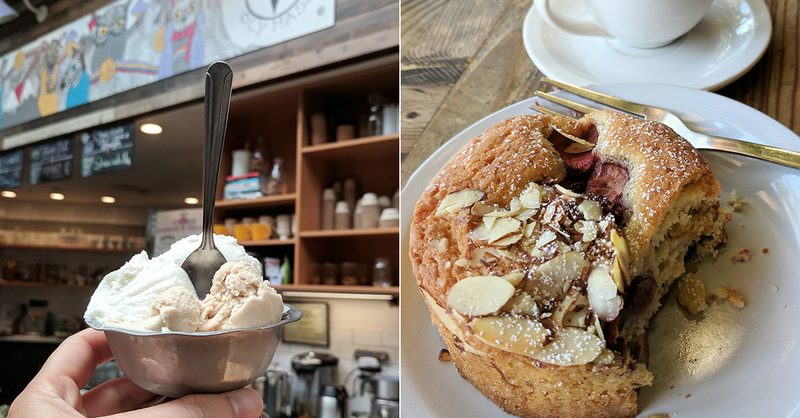 If you are one of these people, we want to be your friend, and you should check out Hart’s Mesa next time your scouting the best breakfast in Olympia, WA. Hart’s Mesa is a cozy joint in downtown and features an eclectic menu with Latin-inspired dishes like the Chipotle Benedict, Migas, and Chilaquiles. It may not be a surprise that when it comes to vegan food, Olympia, WA doesn’t disappoint. Vegans can rejoice that the kitchen at Hart’s Mesa takes great care to cook vegan dishes separately from any animal products. Vegan or not, Hart’s Mesa is one of the better breakfast restaurants Olympia, WA has to present. Russians Dumplings are all the rage these days. Little pillows of meat or vegetable filled dough, steamed or fried to perfection, served with sauce and all the toppings. What’s not to love? 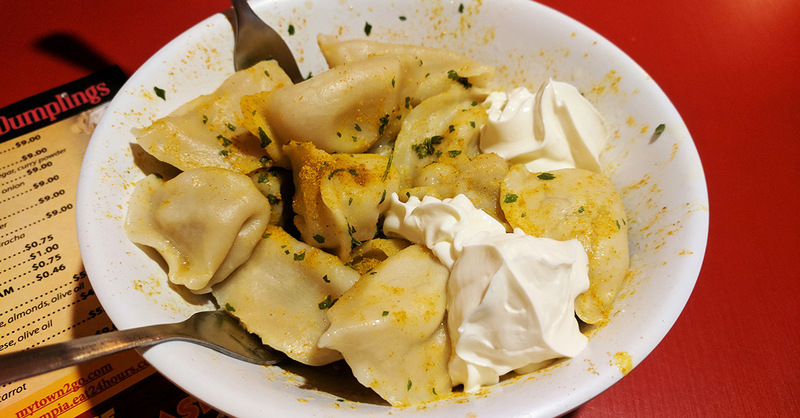 Not playing up the Russian part, for maybe obvious reasons, Rush In Alaskan Dumplings serves various styles of Russian-style pelmeni. There’s meat and vegetarian versions, both doughy and chewy and savory. We recommend starting with the Classic Style, served with vinegar, curry powder, and sriracha and topped with sour cream. We’re not sure if this combo of flavors hails from Russia (Rush Uh?) or Alaska, but it one of those strange-sounding dishes that really works. Take your order to go or find a seat in the small dining area upstairs. 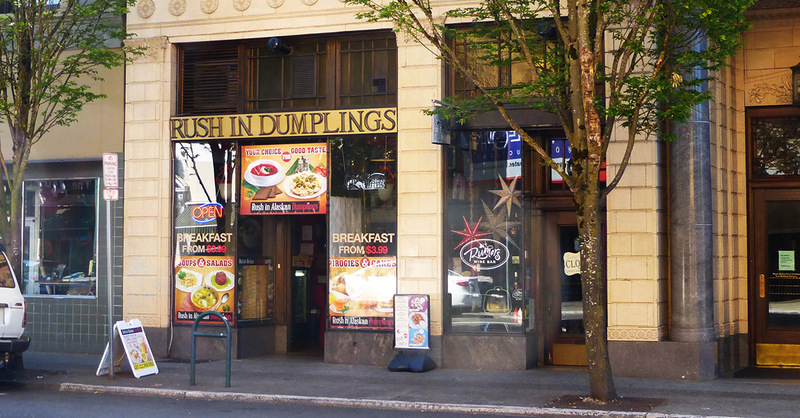 Rush In proves if you’re looking for good puns with a side of interesting and delicious food, Olympia WA is the place to be. Hours: Monday–Thursday and Sunday 10:00 a.m. to 8:00 p.m., Friday–Saturday 10:00 a.m. to 10:00 p.m. 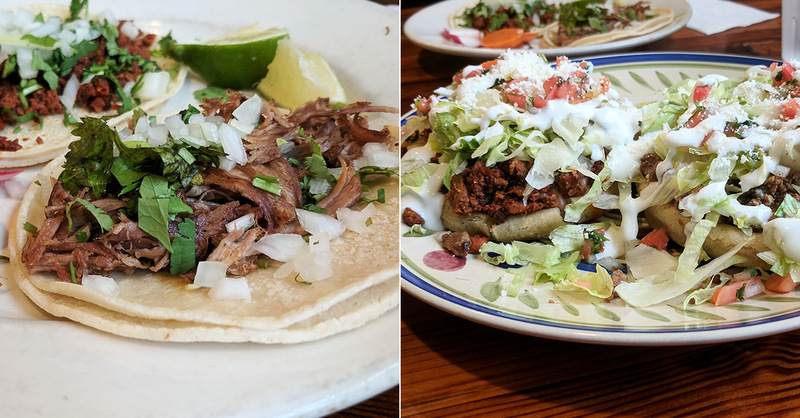 If you find yourself craving carne asada and really need to get your hands on some delicious Mexican food, Olympia doesn’t disappoint. From American-style burrito shacks to authentic Mexican restaurants, Olympia has something for every palate. Olympia may be even farther from the border than Portland, yet some may argue that when it comes to Mexican food, Olympia, WA has Portland, OR beat by a long shot. 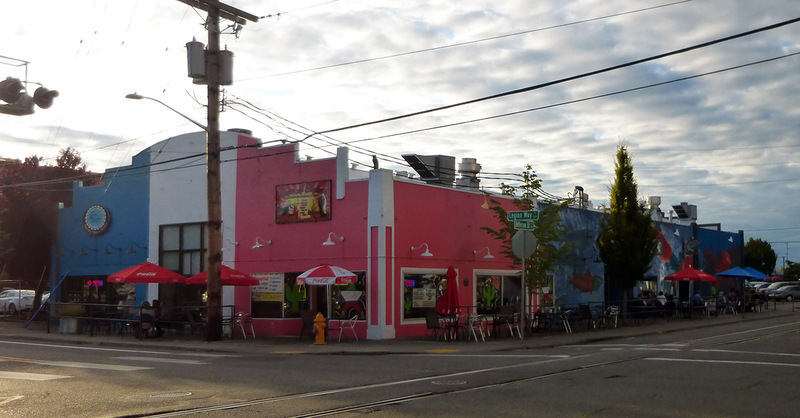 If you’re after cantina-style Mexican food, Olympia residents and visitors alike recommend “The Little Corner.” If we had to rank the best Mexican restaurants in Olympia, La Esquinita would definitely rise to the top. What makes this hole in the wall so great? With an extensive menu that boasts a robust seafood section, La Esquinita is the place for house margaritas and combination plates. While the menu may have everything you’ve ever wanted and more, don’t forget to check out the daily specials. La Esquinita’s meat really delivers. The al pastor is perfectly spiced and the carnitas perfectly crisp. Tacos for two bucks? Don’t mind if we do. Hours: Monday–Thursday and Sunday 10:00 a.m. to 9:00 p.m., Friday–Saturday 10:00 a.m. to 10:00 p.m.; Happy Hour Monday–Friday 2:00 to 5:00 p.m. If one exists, it’s at Los Tuleños. 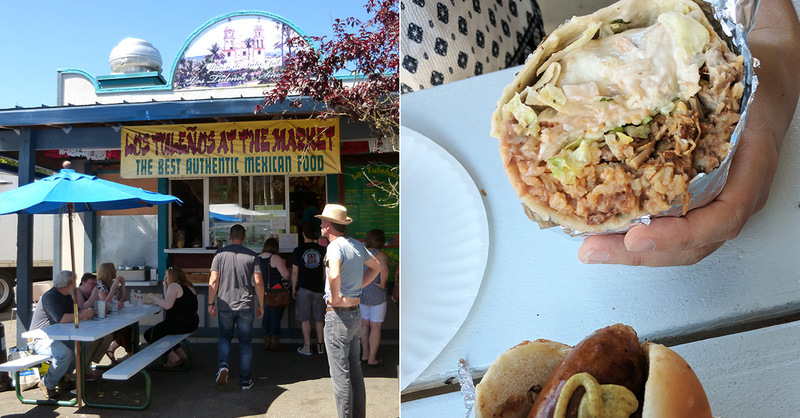 This stall at the Olympia Farmers Market boasts the best authentic Mexican food Olympia has to offer, and we’re pretty sure it’s the truth. The super burrito is layered with refried beans, meat, lettuce, sour cream, and pico de gallo… Obviously these folks are professionals. Burritos are the size of a semi, so bring a monster appetite or, better yet, save half for fourth meal. This is not fake news. Los Tuleños is muy auténtico. Los Tuleños may be famous for their burritos, but be sure to try their other Mexican fare too, like fish tacos and chile rellenos, or mole chicken. It’s no frills friendly service and good Mexican food in Olympia. Hours: January to March Saturday only, April to October Thursday–Sunday, and November to December Saturday–Sunday plus 12/22, 12/23, and 12/24 from 10:00 a.m. to 3:00 p.m. While the stereotype might suggest Olympia restaurants cater to vegans and granola hounds, the Olympia food scene has its fair share of diners, burger shacks, and barbecue joints. Some are veggie-friendly, others are decidedly not. Bottom line, if you’re looking for the best burger Olympia serves up, or some tasty ribs and sides, our guide has you covered. If you’re after a comfortable local spot for local people, and friendly visitors, Cascadia Grill delivers in both ambiance and food. The cafe makes you feel like you’re snuggled under a flannel blanket and is decorated with Cascadia flags, headshots of famous Cascadians, Cascadian vistas, and even a Bigfoot, the mascot of Cascadia, hunkering over the hall to the restroom. 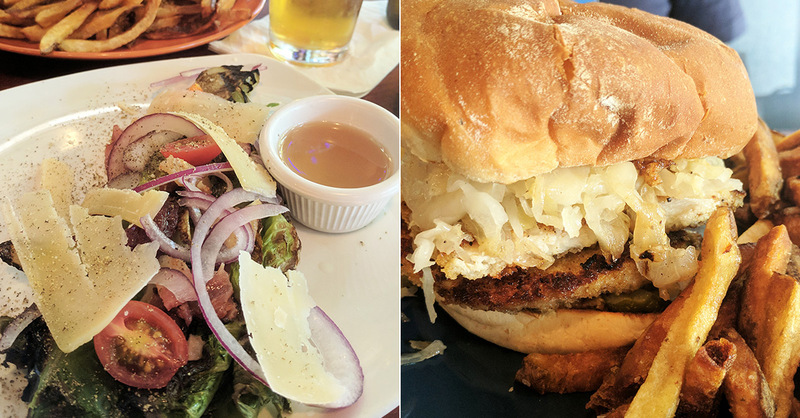 The word “overboard” may slip into your mind but is quickly squashed when you sink your teeth into some excellent comfort food, like the famous Der Schnitzel Sandwich, seared ahi tuna, or the best burger in Olympia (meat and vegan). On that note, if you’re on the hunt for vegetarian restaurants, Olympia locals would likely point you in the direction of Cascadia Grill as one that has a decently-sized vegetarian and vegan menu. If you try any seafood from Cascadia Grill, you can feel justified in wearing your high hat as the menu is certifiably Ocean Friendly. The bar serves, you guessed it, Cascadia-made wine and beers, a delightful selection of wine and beer cocktails, and features live music most nights. 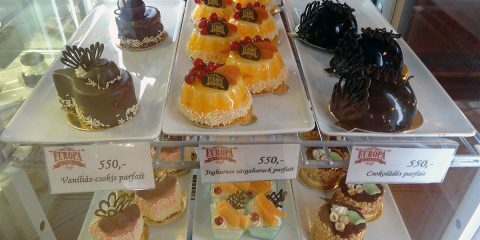 Thinking dessert? Two words: Beer Float. Come for the cozy ambiance, stay for some of the best food in Olympia. Hours: Monday–Thursday 11:00 a.m. to 9:00 p.m., Friday–Saturday 11:00 a.m. to 10:00 p.m., Sunday 11:00 a.m. to 8:00 p.m. If a marquee has to say the vibes are good, are the vibes really good? Fortunately in the case of South Bay Dickerson’s BBQ, the meat is good so the vibes take second stage (and for the record, they’re good as far as we can tell). If you’re not a vegetarian or vegan and are looking for some of the best food in Olympia, WA, Dickerson’s is the place to be. Ribs, ribs, ribs… sorry, what was that? We started dreaming about a Dickerson’s 1/2 rack, a pile of smoked ribs with a side of mac and peach cobbler. Yes, you read that correctly: you can get peach cobbler for one of the sides. There’s sandwiches of the sausage, chicken, and pulled pork variety, and something called The Big Hit Combo with all three. 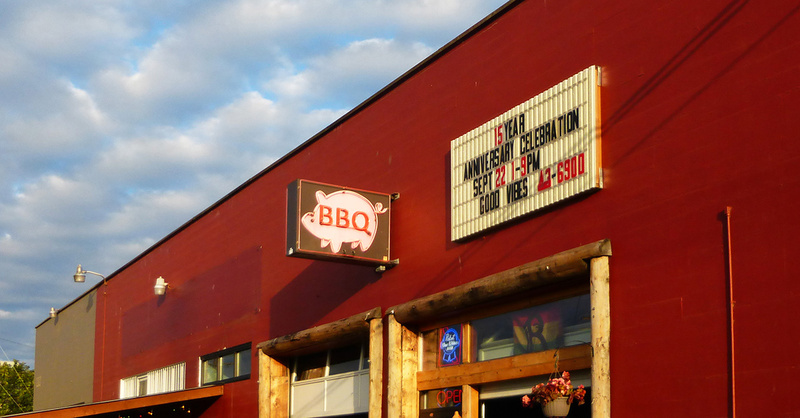 As far as downtown Olympia restaurants go, Dickerson’s South Bay BBQ is one of the meatiest. Hours: Monday–Saturday 11:00 a.m. to 9:00 p.m.
222 Market is one of those places you could stay all day and eat your way from breakfast through dinner with snacks in between. This yuppified food court opened not so long ago, in 2015. All the upscale food and dessert in one convenient location! At the start of your day, head to Bread Peddler Cafe for an espresso and a buttery croissant. Then pop over to their Bistro (only open Friday through Sunday) for and elegant brunch Olympia, WA-style. For a late lunch head over to Dos Hermanos Mexican Kitchen for tacos on handmade tortillas and a Mezcal to wash it all down. Now it’s gelato-thirty, and Sophie’s Scoops has you covered. Try the Salty Butterscotch and Oly-Fog, made with black tea, rose, and vanilla. You couldn’t invent a more Olympia ice cream flavor. It is happy hour yet? 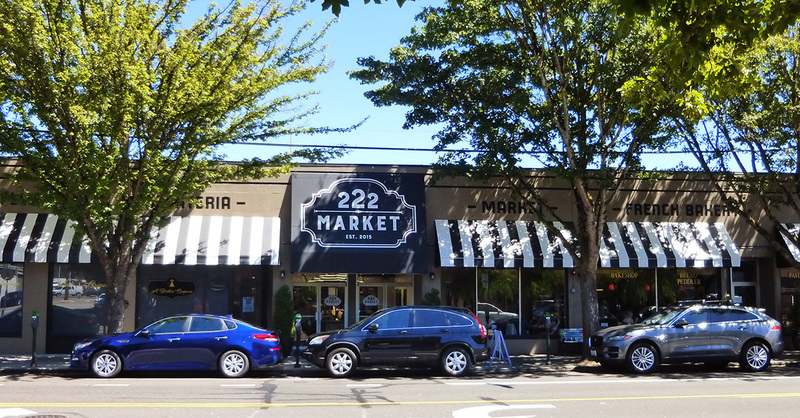 At 222 Market it is, and it’s time to head to Chelsea Farms Oyster Bar, which serves some of the best seafood in Olympia, for a cocktail and oysters, of course. 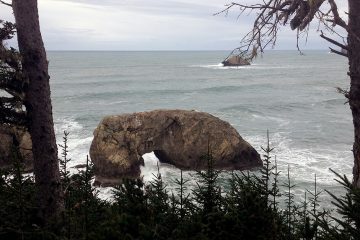 Far from the Mediterranean, in the South Puget Sound, lies a sleepy hollow named Olympia, Washington. 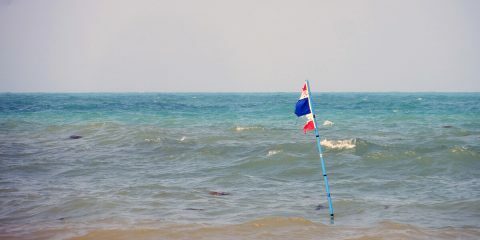 Unlike the Mediterranean, it rains 9 months out of the year, and unlike the Mediterranean, you won’t find many speedos on her beaches. But like the Mediterranean, you will find delicious gyros, mouth-watering falafel, and sumptuous hummus and tabouli in Olympia, Washington. So close your eyes, imagine blue waters and yellow sunshine, visit one of Olympia, Washington’s best restaurants for Mediterranean food and be instantly transported. At the very least, you’ll eat some damn fine food! If one day while strolling around Olympia, Greek food calls your name and you stop in your tracks and don’t know what to do next, head over to the Gyro Spot. The gyros are so authentic they transported us to Athens. They are made with seasoned meat, soft pita bread, crisp lettuce, juicy tomatoes and slathered in tzatziki. Perfect for a quick lunch or fourth meal after your pub crawl (open late on Friday and Saturday). Go Greek in Olympia and you won’t be disappointed. The salad sides are a perfect accompaniment to your gyro or main dish. Ours was a little too heavy on the dressing, but other than that it was fresh and full of plump olives and dusted with feta cheese. 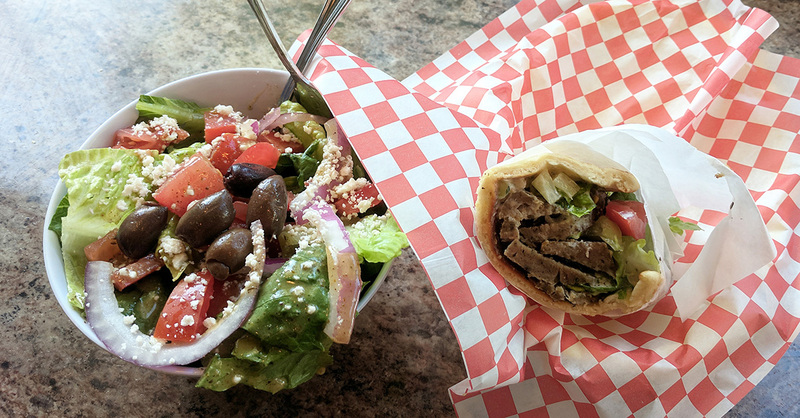 If you are looking for a great Olympia Greek restaurant, the Gyro Spot (or their second location, Gyro Spot Express) will satisfy your craving. Hours: Monday–Thursday and Sunday 11:00 a.m. to 9:00 p.m., Friday and Saturday 11:00 a.m. to 2:30 a.m.
Don’t let its shopping-center location fool you: Mediterranean Breeze is one of the best restaurants in Olympia. Locals love this place for its Turkish specialties like pide (on the menu as “Turkish Stuffed Flatbreads”), shish, and irmik, a unique Turkish dessert made with semolina and served with ice cream. 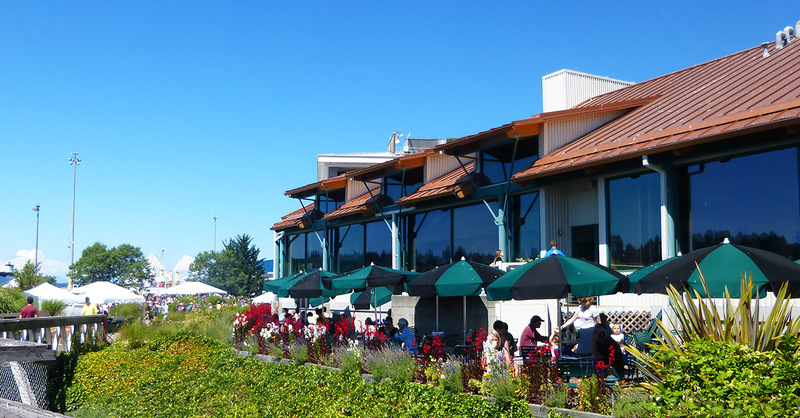 West Olympia restaurants may not get as much tourist traffic as downtown, but it’s worth heading across the bay for Mediterranean Breeze, maybe after your hike though The Evergreen College campus. They even have Italian pizzas and pastas in case Turkish food isn’t your thing. Hours: Monday–Thursday 11:30 a.m. to 9:00 p.m., Friday–Saturday 11:30 a.m. to 10:00 p.m., Sunday 12:30 p.m. to 9:00 p.m. Thank goodness for Thai restaurants. Thai food is healthy, inexpensive, and even the mediocre Thai restaurants are usually alright. Fortunately if you’re craving Thai food in Olympia, there are a couple of spots that are even better than mediocre. Fear not, lovers of Thai restaurants, Olympia, WA does not disappoint. 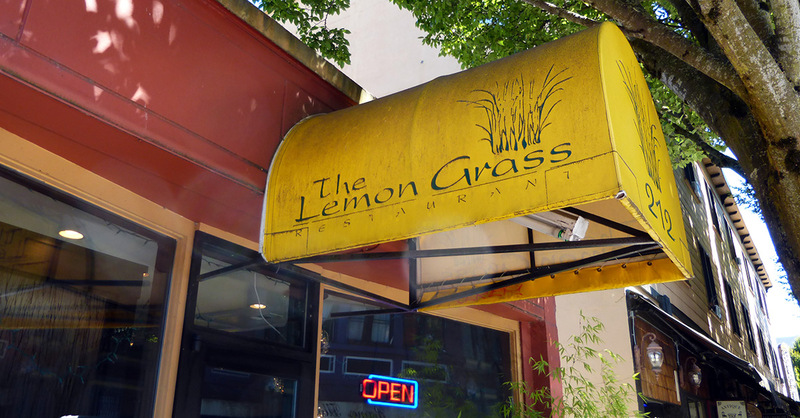 The Lemon Grass Restaurant is not your average hole-in-the-wall, takeout joint. A bit more upscale, with prices to match, it’s well worth the expense for some the the best Thai food Olympia serves up (they also have locations in nearby Lacey and Tumwater). You can find your classic faves like Tom Yum soup and Pad Thai, but we suggest getting out of your comfort zone here. Try the Cheing Mai Salad, lemongrass chicken served in a tangy sauce with vegetables and ground peanuts, or the dish called Heaven Beef (it’s gotta be good), or Basil Scallops. Go for the fun dish names like Purple Passion or Jungle Prince, and stay for the delicious Thai food. 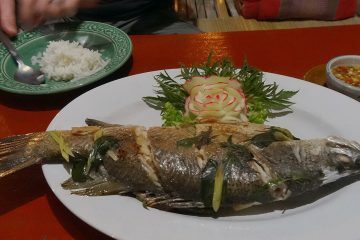 For a cheaper but just as delicious Thai-food option in Olympia, Thai Pavilion is a more hole-in-the-wall, basic joint. One of those restaurants that tries to double as a general Asian food place, Thai Pavilion menu features a number of Chinese dishes. Stick with Tom Yum soup and Penang curry and you won’t be sorry. Or, branch out and order the Evergreen State Curry, a Massaman curry with Washington-grown apples. When it comes to seafood, Olympia offers a couple of options. 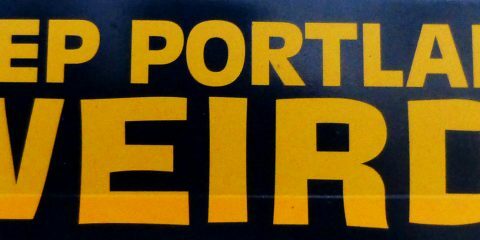 There are two restaurants to recommend on the short waterfront. As you might expect, you pay for the location. Anthony’s restaurants in Olympia are what you’d expect from seafood chain restaurants: decent, if overpriced seafood, including clam chowder, served in palate-pleasing large portions; fancy cocktails; a great Happy Hour (show up before 6:00 p.m. for a 4-course meal for $25); and wonderful harbor views. Come to Anthony’s for the view and Happy Hour. Anthony’s Homeport: Monday–Thursday: 11:30 a.m. to 9:30 p.m., Friday–Saturday: 11:30 a.m. to 10:30 p.m., Sunday 10:00 a.m. to 9:30 p.m.; Happy Hour daily 3:00 p.m. to 7:00 p.m.
Anthony’s HearthFire Grill: Monday–Thursday: 11:30 a.m. to 9:30 p.m., Friday–Saturday: 11:30 a.m. to 10:30 p.m., Sunday 10:00 a.m. to 9:30 p.m.; Happy Hour daily 3:30 p.m. to 7:00 p.m. Despite appearances, Budd Bay is not a chain restaurant. 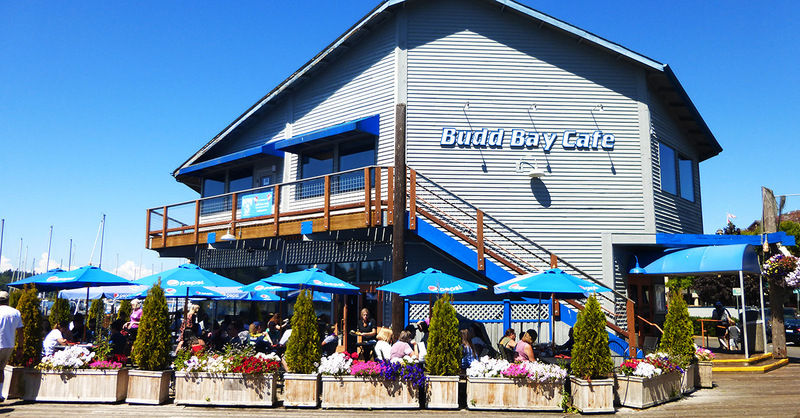 Located at Percival Landing since 1988, Budd Bay features great brunch and Happy Hour, with the menu balancing seafood and non-marine selections like steak, vegetarian appetizers, and fresh-baked sourdough bread. If you can find a seat on the patio or by the window, that is. Budd Bay is a popular go-to spot for locals and visitors alike, with reasonable prices (for the location anyway) and good service. Hours: Monday–Thursday 6:30 a.m. to 8:30 p.m., Monday–Thursday 6:30 a.m. to 9:00 p.m., Sunday 9:30 a.m. to 8:30 p.m.
Don’t fear, they have beer in Olympia. Three of the finest Washington state breweries are in Olympia—and they all serve food. Olympia, WA breweries build on the tradition of the defunct Olympia Brewing Company, which made “Oly” in nearby Tumwater. But the beer is much (much) better at these Olympia brew pubs, and the food more than satisfying. Fish Tale Brew Pub (not Fish Tail), affectionally known as “The Pub”, is Olympia’s oldest brew pub, since 1993, and an old standby for our stopovers to/from Seattle. 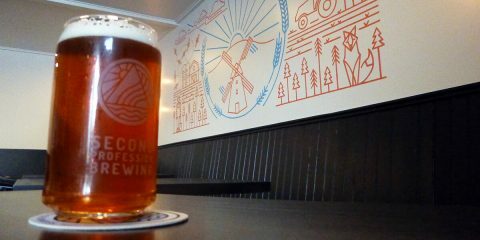 Even though Olympia has two more breweries added to the scene, locals frequent The Pub as much as ever, especially with a recent expansion to accommodate more families (the 21-and-over bar section remains). Serving as the primary retail location of Fish Brewing Company (formerly Fish Tale Brewing), the Fish Tale Brew Pub menu offers a standard selection of brews plus a number of rotating seasonal taps, all drinkable and cold just as you’d expect from long-time brewery. Food-wise, you can expect typical pub fare which includes local seafood; fish-and-chips are an all-time favorite and fish tacos come highly recommended. Hours: Monday–Thursday 11:00 a.m. to 10:00 p.m., Friday 11:00 a.m. to midnight, Saturday 9:00 a.m. to midnight, Sunday 9:00 a.m. to 10:00 p.m.
Like a lot of new breweries, Three Magnets Brewing goes down the industrial chic route but with a Pacific Northwest twist: located in a warehouse, with a set of big garage doors, it’s appointed with communal tables made from thick slabs of dark wood, local soccer-club (Seattle Sounders) paraphernalia, and several PNW-themed stained-glass panels above the the busy bar. Though some breweries have a hard time pulling off hipster-vibe and remain cozy, Three Magnets manages seemingly without effort. If you go just for beers and snack, you’ll love it: the epic charcuterie plate complements a broad assortment of IPAs. The pubhouse menu is upscale (borderline annoyingly so) but offers something for every beer and big-portion lover. 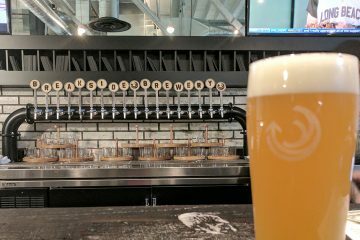 The newest of breweries in Olympia, WA, established in 2018, has the best brand story, building on the tradition of brewing here and the water (the number in its name is that of an artesian well underneath the building). In the same vein, the brew house puts on a good face: attractive staff serve more than decent beer and eclectic pub fare, including above-average pizza, in an airy, industrial-chic pub. It’s almost as if it were a place where you come to be seen, except the giant TV screens showing Seattle Sounders and other sports events bring it to the level of a regular ol’ pub. With so few breweries Olympia, WA has and with Well 80 being so new, we’re happy to have a place to stop to watch how well it does in its location on the edge of downtown. Hours: Monday–Thursday and Sunday 11:30 a.m. to 10:00 p.m., Friday–Saturday 11:30 a.m. to 11:00 p.m.